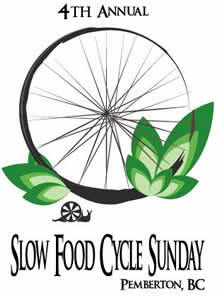 This past Sunday, despite the blazing heat, I participated in my first slow food cycle. I am no stranger to slow cycling, as Grant and I did that for two months last year on the Slow Coast. And I am no stranger to food, as anyone who has sat next to me at a restaurant can attest to(“are you going to finish that?”). But I have never combined the two. Actually, it’s the food that’s slow, not the cycling. On Pemberton Slow Food Cycle Sunday visiters are invited to cycle around from farm to farm and sample food that was grown, prepared and served by the local farmer. Growing food is time consuming and hard work, especially when it’s organic, and this event is all about taking time to appreciate quality local food, and the people who grow it. So how does this relate to being waste free?I’ll admit, there is nothing intrinsically zero waste about the slow food cycle, but I will say that we were very supported with our tupperware containers at all of the food stops. I got comments all day about what a great idea it was to bring a container and a fork. Perhaps next year, they’ll mention it on the website, so more people will remember to bring their own. It was also great that we got to buy veggies right off the farm with no bag or reciept and buy lemon aid from kids at road-side stands with real glasses. I learned lots about potatoes. Pemberton is a potato seed valley that specialized in growing high quality, disease free seed potatoes for other farmers (it is actually illegal to bring outside potatoes into the area because they might contaminate the fields). The saddest thing I learned was how much food gets wasted. If the potatoes are not exactly the right color, they get rejected by the big buyers, and farmers have to plow over an entire field. It’s true that the potatoes get composted, but what a waste of time and energy for something that has nothing to do with health or taste. As someone who is trying to cut down on needless waste on a small scale, I felt pretty disheartened. Nevertheless, it’s great to see people get out on their bikes, enjoy the fresh air, and see where their food comes from. Part of wanting to have less impact on the earth is getting out there and enjoying it. If you’re never out there, why would you care to protect it? All I can hope is that next time I’m at the grocery store I’ll remember my slow food sunday and try to buy local as well as waste free. Hi Claire, Great to hear from you! Contrary to popular belief, we don’t shop with loose peanuts in our basket. Right now we are re-using bags we already had in the house (lord knows we have a lot) like bagel bags and old bulk bags. I have also made one light cotton baggie that is reusable. We avoid the twist tie by writing the number on our hands. When I get more organized, we’re going to make a bunch of the cotton baggies with string ties, number them 1-10 and carry a piece of paper on which to write down the bin numbers. I realize this is an old post but wanted to add that there is a Slow Food Cycle tour that takes place in Agassiz, BC in the summer. Which is a small town east of Vancouver. Three years ago Chilliwack joined and they are on the same weekend. Cycle Agassiz one day stay overnight in Harrison Hot Springs then cycle Chilliwack the next day on your way back to Vancouver. With cheese, coffee, herbs, hazelnuts, honey and much more. Make it a S-L-O-W weekend. Vist http://www.slowfoodvancouver.com for this years’ dates. Thanks Erin. I haven’t done the Agassiz tour myself, but I hear it is really great. Hoping to get out to it this year!